Spearheaded by a gold medal from women's marathoner Bai Xue, the Chinese track and field team exceeded expectations at the World Athletics Championships in Berlin, earning one gold, one silver and two bronze. However, local officials are not getting carried away with the results and claim Chinese athletes still have a long way to go before becoming a force on the world stage. "The Chinese team achieved good results due to their fighting spirit and confidence and some of the athletes performed beyond their real level," said Du Zhaocai, director of China's Athletics Administrative Center. "We can't say that Chinese athletes have made great progress. We still have to work hard." Chinese expectations had been low heading to Germany, largely because of the absence of former Olympic and world champion men's 110 meter hurdler Liu Xiang, who has not competed since walking away from his heat at last year's Beijing Olympic Games. China ended up with only two track and field medals - both bronze, at the Games. An unexpected silver medal from Wang Hao in the men's 20km walk on the opening day of the World Championships boosted the spirits of the China camp in Berlin. After that, China's Liu Hong finished third in the equivalent women's event and Gong Lijiao claimed a bronze in the women's shot put. Bai's surprise victory on the final day earned high praise and she is now seen as a potential gold medalist at the 2012 London Olympics. The Chinese women marathoners also claimed a team Cup as Bai's compatriots, Zhou Chunxiu and Zhu Xiaolin, finished fourth and fifth. China's best performance at a World Championships came in Stuttgart, Germany, in 1993 when they won four gold, two silver and two bronze medals. "Wang's silver is the first medal for China's men in a top-level (walk) competition and has boosted our confidence but we are still not powerful enough to maintain such an advantage," said Du. "However, the results in Berlin were a good start for our preparations for the 2012 London Olympic Games. Race walking will be a definite medal target for the Chinese Olympic delegation." Women's walking used to be a strong event for China. Chen Yueling won the gold medal in the 10km at the 1992 Barcelona Olympics and Wang Liping claimed gold in the 20km at 2000 Sydney Games. 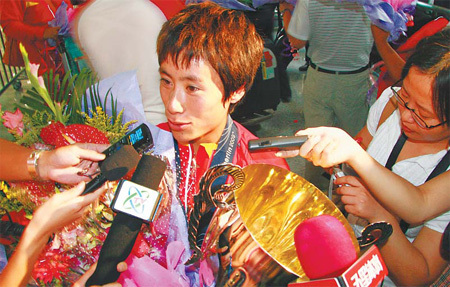 At the 1999 Worlds, China's Liu Hongyu and Wang Yan finished one-two in the 20km. The rejuvenation of the walking team could be attributed to the work of an Italian coach who was invited to hold clinics for the national team. Wang, and several of his teammates, also went to train with him in Italy. Such international expertise will be called upon more often in the future, Du said. "We will pay more attention to elite international coaches and combine their experience with our own situation," Du told the China Daily.